Minecraft Skill Trees is the first Skill Tree mod to use my Library SkillTrees (needed and found here) and acts as a showcase as well as a development tool for Skill Trees mods. What this skill tree does is that it requires you to unlock a skill before you can craft certain items. You can unlock a skill by obtaining Skill Points and Experience. You can see what the skill requires by hovering over the skill. It is planned to add have more skills. To open the Skill Menu, press "k."
You start the game with 5 Skill Points. You earn more skill points by either getting achievements or by consuming a Skill Gem. 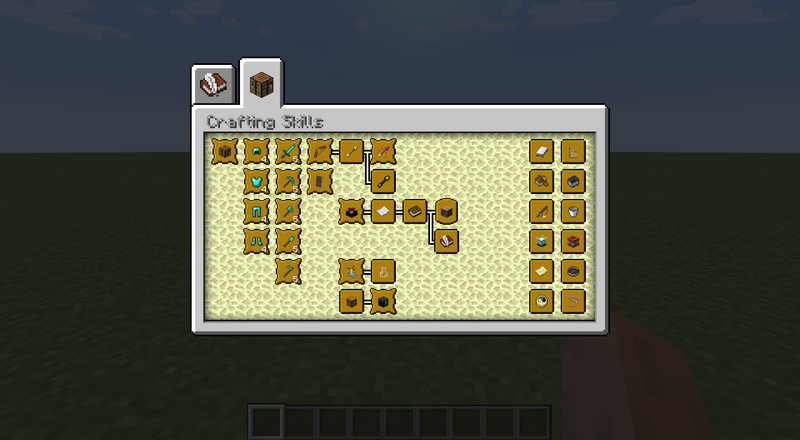 You can craft Crafting Tables like normal, however, you cannot open the interface unless you have the Crafter's Skill. 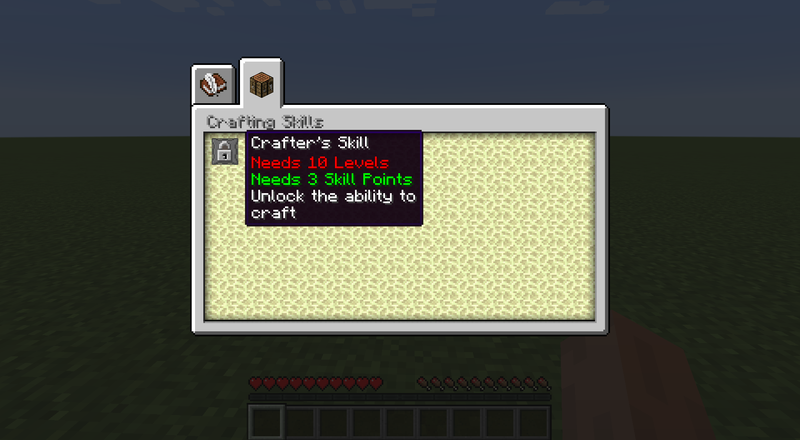 The Crafter's Skill cost 3 skill points (referred to from now as SP) and 10 levels. Obtaining these levels may be difficult as you have don't have access to any tools or weapons you normally do, so you may want to try to scavenge some armor/weapons from a village. Perhaps you will appreciate Crafting Tables after this. You can open the Skill Menu, by pressing "k."
After you manage to get 10 levels, you're not done yet! The skills will become visible to you and you can choose what you want to put your points into. All armor, weapons, and tools are locked. This includes most items from other mods. To unlock them, you need to rank up your skill to a high enough level in the corresponding skill. 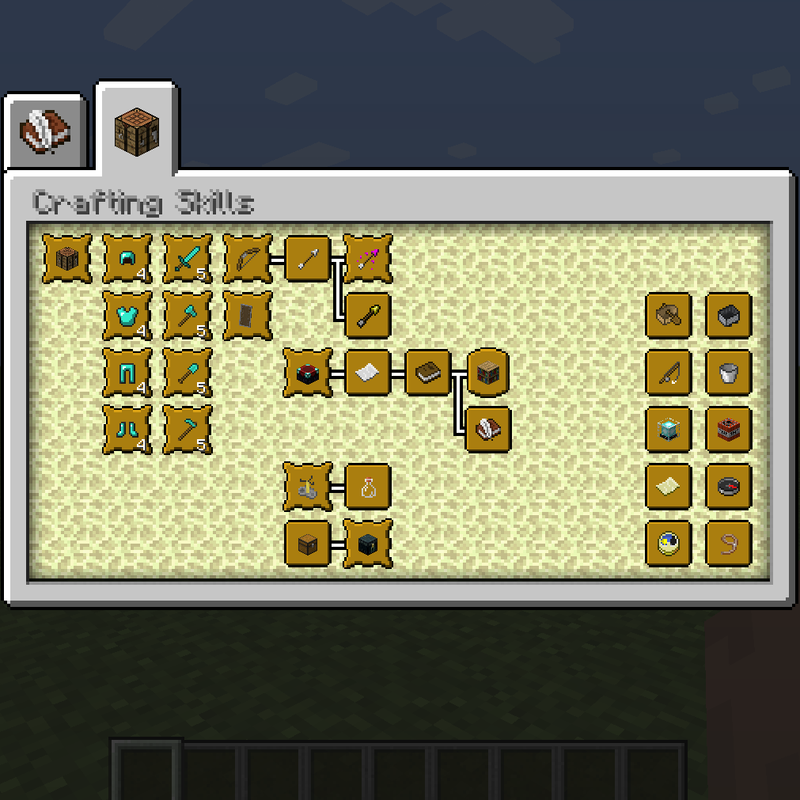 The order of progression is for armor/tools is: Leather/Wood >> gold/stone >> iron/gold >> diamond/iron >> -/diamond. Each tier requires more skill points and more levels. (Later version will allow you to prestige and unlock more skills). Armor, weapons, and tools aren't the only things that are locked. Furnaces, Enchanting Tables, Brewing Stands, Doors, Beds, and even Chest are locked! It is up to you to figure out the best way to proceed based on your needs. Be careful though, you can't refund skills once you buy them! If this could get CraftTweaker support for mods I'd be all over this. I think he wants to be able to use CraftTweaker to be able to create skill trees. I would like to be able to do that as well, actually. It would fit very well in a pack I'm working on. Well, you can create one using Java using this library that is what I made it for. I never used it before, and I'm not sure how it would work. I think they would need to implement a system. I can probably create a Json system for creating skill points with limited functionality. Or if you meant you would like to be able to customize this mod, I could add a gui config to change how much each skill cost, the start skill points, rewarded points per achievement. The Furnace skill is missing in 1.0.0.0, uploaded a fixed version and waiting for approval (progress will not be lost).